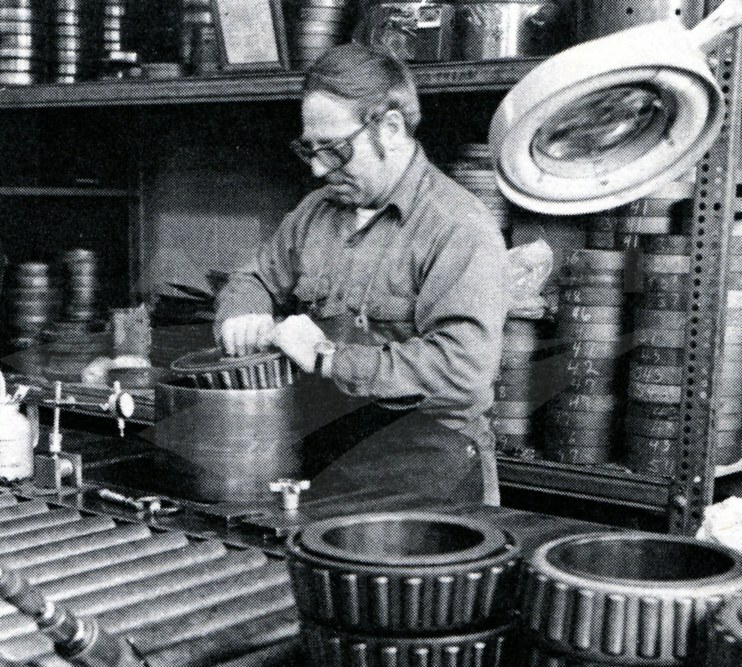 Employees working on the shop floor in the late 1970s or early 1980s. When Amtrak began service on May 1, 1971, the company actually had very few employees, as most functions continued to be contracted out to the railroads from which Amtrak had taken over intercity passenger service. A June 1972 amendment to the Rail Passenger Service Act specifically stated: “Insofar as practicable, the Corporation shall directly operate and control all aspects of its rail passenger service.” But this interim period allowed Amtrak to analyze current railroad operations and determine how to more efficiently run its services by combining redundant jobs. 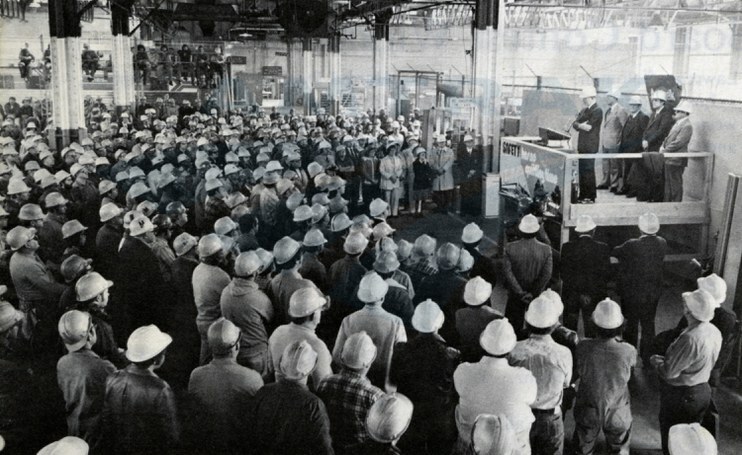 By the end of 1972, the company employed 1,522 people across the country. It also worked out an agreement with the predecessor railroads whereby their employees could switch over to Amtrak but have a six year window to return to their original jobs without losing established benefits. In the first 18 months of operation, Amtrak took over essential services such as group travel arrangements, reservations and ticketing, and on-board functions including work performed by stewards, chefs, and sleeping car attendants. an excellent 1978 safety record. Amtrak also made strides to establish its own maintenance and repair facilities rather than contract out the work to predecessor railroads. On April 1, 1975, Amtrak purchased the Beech Grove, Ind., shops from the Penn Central Transportation Company. The need for a major repair facility that could accommodate all types of existing equipment—and the Amfleet and Superliner cars on order—was acute, and Amtrak immediately embarked on a five year, $22 million improvement plan to modernize the facility. The Annual Report for fiscal year 1975 reads: “Since takeover, production improved from four to six cars [repaired] per week by establishment of better inventory control, material handling and production procedures.” Negotiations were also begun to acquire other shops and yards from the Penn Central, Seaboard Coast Line and Santa Fe railroads. The company called attention to the benefits of the Beech Grove improvements in 1980: “The…program has already improved the overall operating efficiency of the facility, reduced energy consumption, reduced air pollution to comply with Environmental Protection Agency standards, and improved employee working conditions… [changes are] permitting equipment overhauls to be performed ‘in house’ rather than at a more expensive contract facility.” These overhauls included the conversion of older cars from steam power to electric Head End Power. Rather than spend at least $1 million to buy a new car, rehabilitation of an older unit could be done at Beech Grove for approximately $310,000. 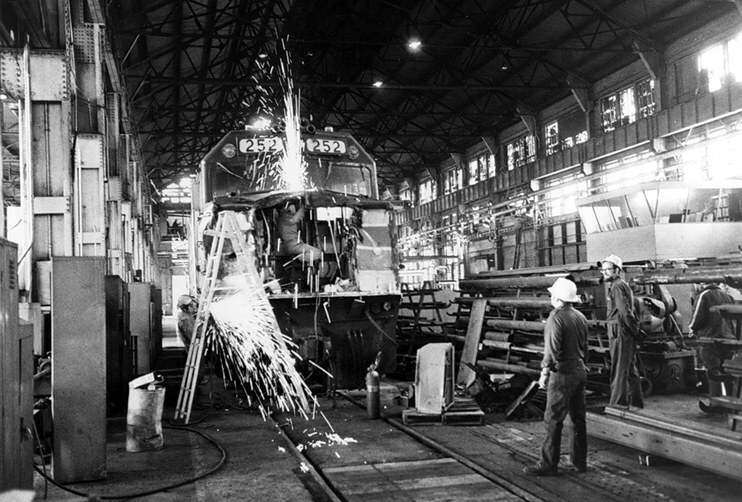 Beech Grove employees repair a F40 locomotive, 1980s. In American railroading, the shops at Beech Grove have a storied history that includes service to four railroads. They were erected between 1904 and 1908 by the Cleveland, Cincinnati, Chicago, and St. Louis Railway—commonly referred to as the “Big Four”—that ran a network stretching across the heart of the Midwest into Illinois, Indiana, Michigan, and Ohio. The facility served as the company’s major repair shop for steam locomotives and passenger and freight cars, and also contained an extensive freight rail yard. Period railroad magazines covered the construction with interest, marveling at the design of the two story machine and erecting shop whose gigantic windows allowed natural light to flood the interior. Surrounding this important building were the smaller coach, paint, boiler, and wheel shops. Although acquired by the New York Central Railway (NYC) in 1906, the Big Four operated as an independent entity until it was finally subsumed by its owner in 1922. The shops remained in the hands of the NYC until it merged with the rival Pennsylvania Railroad in 1968 to form Penn Central, whose tenure was short-lived as it declared bankruptcy in 1970. Six hundred and forty acres were originally dedicated to the shops and rail yard. Additional land was turned over to a railroad-financed real estate development firm that surveyed, platted and sold lots to establish a community for arriving workers. Although now surrounded by the state capital, Beech Grove remains an independent city, proud of its rich rail heritage. Amtrak's Business Car 10001, the Beech Grove, is named in honor of the shops and town. Today, Amtrak has about 550 employees at Beech Grove, many of whom have honed their specialties for years. Some of the newest are the sons and daughters of older employees—love of the steel rails seems to run in the blood. Senior staff act as mentors and pass on their accumulated skill sets to the next generation. Many have great stories to share about how the technical side of railroading has changed over the decades, and some remember Amtrak’s early days. 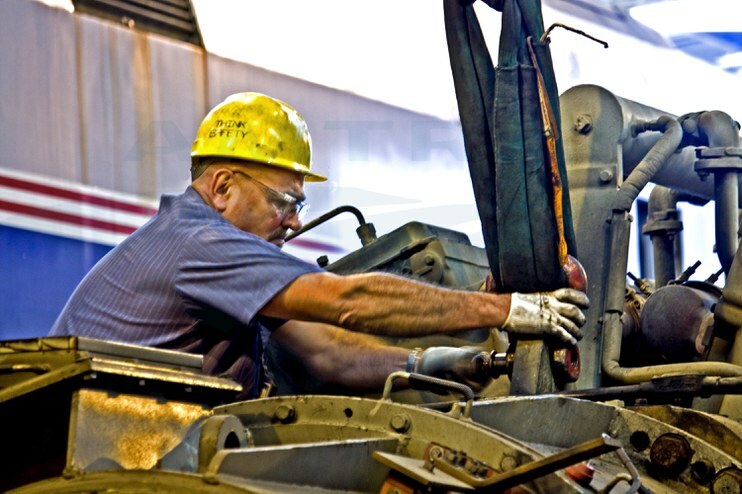 A machinist attaches a lift strap to a GE locomotive block. Beech Grove supplies components to other Amtrak maintenance facilities, including couplers, overhauled air conditioners, overhauled air brake valves, and about 300 other types of components not available elsewhere. 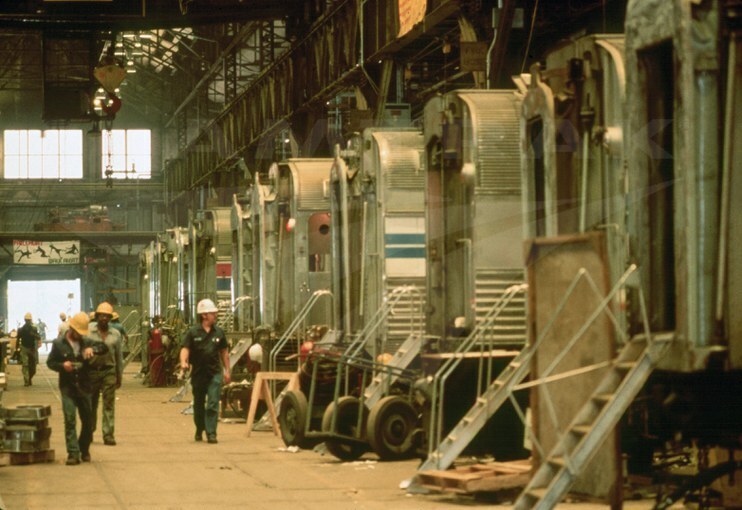 Under grants received through the American Recovery and Reinvestment Act of 2009 (ARRA), Beech Grove restored nine damaged or stored Superliner cars and 11 diesel locomotives. These cars and locomotives expanded the Amtrak fleet and allowed for greater capacity on trains and growth in ridership. Annual Reports for fiscal years 1975-1980, National Railroad Passenger Corporation. Family Days: 1981 Tenth Anniversary (Booklet), National Railroad Passenger Corporation. Jim Hillman, John Murphy and the Beech Grove Public Library, Images of America: Beech Grove; (Charleston, South Carolina: Arcadia Publishing, 2011).